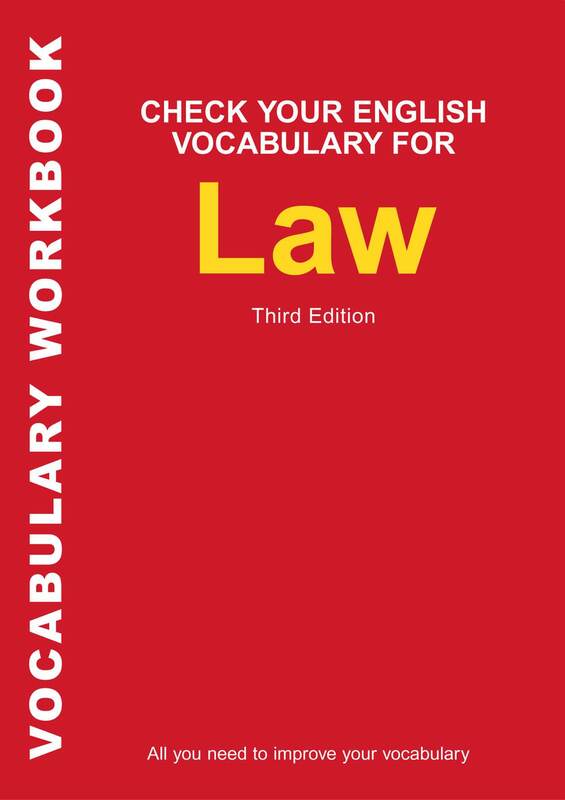 Check Your English Vocabulary for Law by Rawdon Wyatt is a workbook designed to help non-native English speakers improve their knowledge and understanding of core legal terminology. The workbook includes crosswords, puzzles, and word games to test English vocabulary and a combination of self-study exercises and practical speaking activities mean that this book is ideal for both home- and class-based study. This book has been written for anyone working or training to work in the legal profession, or for anyone whose job requires them to have a working knowledge of legal words and terms. The various exercises throughout the book focus on the key vocabulary that you might be expected to understand and use on a day-to-day basis. You should not go through the exercises in this book mechanically. It is better to choose areas that you are unfamiliar with, or areas that you feel are of specific interest or importance to yourself. Each exercise is accompanied by a full answer key at the back of the book. This key also gives you other information about particular vocabulary items (for example, words with similar meanings, alternative words and expressions, etc) that are not covered in the exercises themselves. 1. Many of the words, expressions and accompanying notes are based primarily on the English and Welsh legal system. However, there are also many ‘generic’ words which can be applied across the international legal spectrum, and would be recognised in other places such as the USA and Canada. 2. Not all of the vocabulary practised in this book is legal vocabulary per se (see page 45 to find out what this expression means), but would be used in a legal context (for example, at a trial or tribunal, or when producing a contract or negotiating business terms). 3. A lot of the words and expressions which have been presented here in a particular context (for example, words connected with a criminal law procedure) might also ‘cross over’ into other areas of law. A jury, for example, is usually employed at a criminal trial, but might also be used in some civil cases, such as libel. It is very important to keep a record of new words and expressions that you learn. On page 64 of this book, you will find a vocabulary record sheet which you can photocopy as many times as you like and use to build up a ‘bank’ of useful words and expressions. It is accompanied on the following page by a sample sheet that shows you how to record a particular vocabulary item. Keep your record sheets in a file or folder and review them on a regular basis so that the words and expressions become an ‘active’ part of your legal vocabulary. We recommend that you keep a good dictionary with you, and refer to it when necessary. Many of the words and expressions in this book (together with their definitions) can be found in the A & C Dictionary of Law. For general vocabulary reference, the Macmillan English Dictionary is also an excellent resource. No vocabulary book can possibly contain all of the legal words and expressions that you are likely to come across or need, so it is important you acquire new vocabulary from other sources. On the next page you will find a short list of useful sources that were consulted during the writing of this book, and you should also read as much as possible from a variety of other sources, including journals, papers and case reports (many of which are available on the Internet).